If you're after a casual yet incredibly stylish ensemble, team a beige trenchcoat with light blue ripped skinny jeans. As well as totally comfy, these pieces look great together. Sporting a pair of Stuart Weitzman round toe boots is a simple way to add some flair to your ensemble. We all ensemble for comfort when it comes to dressing up, and this combination of a grey crew-neck sweater and a black and white horizontal striped mini skirt is a good illustration of that. You could perhaps get a little creative in the footwear department and spruce up your getup with Stuart Weitzman round toe boots. 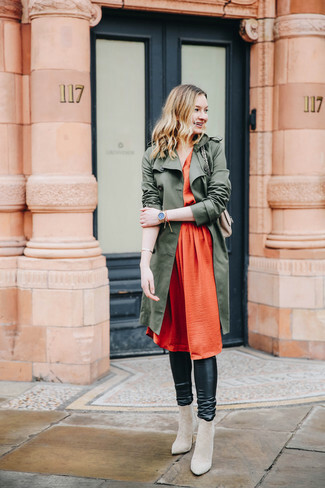 If you're on the lookout for a casual yet seriously chic getup, team an olive trenchcoat with black leather leggings. These two items are totally comfortable and will look incredible together. And if you want to instantly kick up the style of your look with one piece, add Stuart Weitzman round toe boots from farfetch.com to the mix. Rock a burgundy sweater dress for a glam and trendy getup. When it comes to footwear, this look is complemented nicely with beige suede ankle boots. If you're in search of a casual yet seriously stylish ensemble, wear a charcoal open cardigan with charcoal flare jeans. As well as totally comfy, these two items look amazing paired together. Amp up the cool of your ensemble by complementing it with Stuart Weitzman round toe boots. If you're searching for a casual yet totaly stylish ensemble, consider teaming a pink silk blazer with white lace shorts. As well as totally comfy, these two pieces look fabulous together. Amp up the cool of your outfit by rounding it off with Stuart Weitzman round toe boots from farfetch.com. If you're searching for a casual yet totaly stylish getup, pair a grey leather biker jacket with blue skinny jeans. These two garments are super comfortable and will look stunning when paired together. You could perhaps get a little creative when it comes to footwear and dress up your getup with Stuart Weitzman round toe boots from farfetch.com. If you're searching for a casual yet chic look, go for an olive anorak and charcoal skinny jeans. These two items are super comfy and look fabulous paired together. And if you want to instantly up the style ante of your look with one piece, add Stuart Weitzman round toe boots to the equation. Busy days call for a simple yet stylish outfit, such as a dark green crew-neck sweater and black ripped skinny jeans. Up the cool of your getup by completing it with Stuart Weitzman round toe boots.